Ignatius Perrish awoke with the usual hangover symptoms that accompany a drunken night of debauchery - raging headache, bad breath... and a pair of horns growing from his temples. Ig had it all, a privileged upbringing, a caring family, a famous dad and the love of the beautiful, vivacious Merrin Williams. His whole world fell apart when Merrin was brutally raped and murdered under inexplicable circumstances - with Ig the only suspect. While Ig was never actually tried for the crime the court of public opinion found him guilty on all counts. One the first anniversary of Merrin's death Ig is possessed with a terrible power along with his horns, the ability to see into people's darkest desires with just the briefest touch and he plans on using his new found ability to find the real killers of his beloved and extract a suitable vengeance. Being good and praying for the best got him nowhere. It's time for a little revenge; it's time the devil had his due. The idea that Ig acts as a catalyst for other people's innermost thoughts and desires is a stroke of genius and very well orchestrated - dark and disgusting as some people are these sometime morbid desires are lifted by some well placed, albeit dark humour. Instead of getting bogged down with lengthy exposition we learn about the past events through a number of different perspectives, each disparate and yet convincing in its own way. While these could easily have appeared as repetitive, the alternative viewpoints are inter-spaced perfectly with Ig's desire to find the truth while also undergoing an inner battle between good and evil. As a result each of these revelations takes us one step closer to learning the truth of what really happened on that fateful night but also introduces enough red herrings and unreliable narrators to cast doubt and keep the reader guessing. The author also plays with the readers emotions with the timing of these flashbacks, building up Ig's journey and then jumping back in time just before something important happens - like mini cliff hangers. Rather than annoy, this actually manages to heighten the tension and drive the reader into discovering more. One of the things I loved out this book was the depth to the characters, their backgrounds and personalities. Horns is essentially a book about individual people as much as it is about humanity as a whole and the author has a rare gift that colours the characters vividly and brings them into the waking world. Each character is a different shade of grey - there are no real good or bad people - just different perspectives and the author doesn't judge any of them, simply baring a part of their soul that the reader themselves can judge. The use of the protagonist is nothing short of genius, an utterly human - human with inhuman powers, a wreck of a man who clings to sanity and society by the very thinnest of threads, cast out and condemned despite being the victim and finally finding an avenue of retribution. A previously devout Christian who has stepped off the path and is embraced by the devil, internally fighting a war of good versus evil with no clear winner in sight. 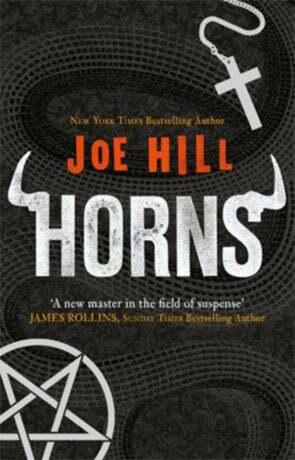 Simply put, Horns is fantastic - the author has managed to weave an incredible tale that combines elements of thriller, horror and fantasy and yet has become something very believable, convincing and utterly compelling. Written on 13th July 2011 by Ant.